Transmural lesions (TLs) are the crucial point for radiofrequency catheter ablation (RFCA) in atrial fibrillation (AF) patients. 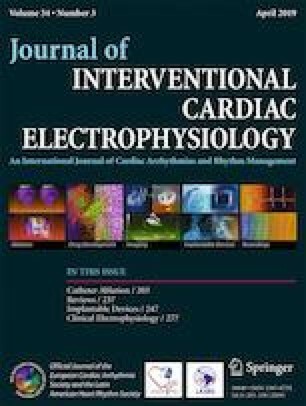 Previous studies have reported that complete positive unipolar electrogram (UP-EGM) after ablation is associated with transmural lesions. However, UP-EGM patterns may differ in different regions of continuous circular lesions (CCLs) around the pulmonary vein ostia after ablation. We aimed to analyze the different UP-EGM patterns in different CCL regions after ablation and the effectiveness of UP-EGM guided RFCA in paroxysmal atrial fibrillation (PAF). A total of 43 patients with PAF (aged 59 ± 11 years; 65% male) were consecutively included. Pulmonary vein isolation was achieved by contiguous point-by-point RFCA. UP-EGM was recorded by the ablation catheter. Both CCLs were divided into six regions. Two points were randomly chosen from each region to analyze UP-EGM type after ablation. All the patients were followed for atrial arrhythmias recurrence. All pulmonary veins were isolated with complete bidirectional block. A total of 1032 RFCA points with complete positive UP-EGM were collected. UP-EGM morphology after ablation was divided into four different types defined as R, rR′, Rr′, and M. M patterns mostly appeared in anterosuperior (65%) and roof (49%) regions of left CCLs. In the remaining regions, the percentage of non-M patterns (R, rR′, and Rr′) ranged from 63% in posteroinferior regions of right CCLs to 88% in anteroinferior regions of right CCLs. After a mean follow-up time of 19 months, 37 (86%) patients remained in sinus rhythm. Most (72%) UP-EGM types after ablation are non-M patterns. Pulmonary vein isolation guided by UP-EGM with a complete positive pattern in PAF patients is reliable. Guohua Fu and Bin He contributed equally to this work. This study was funded by Ningbo Municipal Bureau of Science and Technology (Grant Number 2016C51011, to Dr. Huimin Chu). This investigation was approved by the ethics committee of Ningbo First Hospital.